So a couple things. One is that I haven’t posted in more that a month, one of the longest stretches since starting this blog. My apologies; it has been a hot and busy summer. Thus said, here’s a very simple but really delicious and nutritious recipe for a Lebanese-style bean stew. This normally does not have greens in it, I added kale simple because I like it. It seems like every culture has some sort of rice and beans recipe in their repertoire, the Middle East is no different. This recipe is often eaten for breakfast (I am told) with a fried egg on top, not unlike Mexican huevos rancheros, I suppose. Tonight I ate this for dinner over basmati rice. Lastly, two words of interest here. 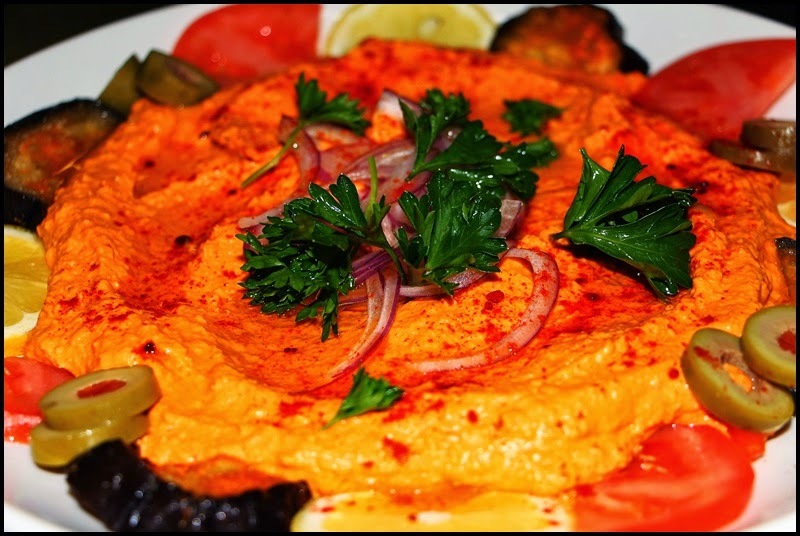 The word fasoulia is simply the Arabic word for beans, and the word baharat, means spices. If you do not have or do not feel like making baharat, use what you like or have, and the beans can be interchanged to your liking as well. Enjoy. Heat the olive oil over medium-high heat in a heavy pot, then add the onion. Cook the onion while stirring for about 5 minutes or until it begins to brown. Add the garlic and cook for another minute or two while stirring. Stir in the baharat, soked paprika, and crushed hot pepper; cook for just a minute while stirring. Add the beans, tomatoes, broth, lemon juice, salt, and kale. Bring to a boil then lower the heat to a very low simmer. Cook for 10 to 15 minutes before serving. Mix the spices together and store in an airtight container, or use as needed. So I’ve posted another version of this recipe a while back, but this one is more adapted to the summer months using fresh tomatoes instead of canned. This version is also a bit smokier and spicier (I increased the amount of smoked paprika and chili flakes). Anyhow, this is a really delicious and nutritious, but simple-to-prepare, vegetable stew. Eat it on its own, with bread, or over rice, it is delicious and filling (I had it for dinner over turmeric-infused basmati rice). Make a double batch because it tastes better the second day. For additional Lebanese inspired recipes, click here. The simple recipe is below. Heat the olive oil in a heavy pot over medium-high heat and add the onion and bell pepper. Cook for a few minutes while stirring, until the onion just begins to brown. Add the garlic and the diced eggplant. Initially the eggplant will absorb the oil and begin to stick to the pan, it is for this reason you should stir nearly continuously for a couple minutes. Once the eggplant softens, begins to brown, and releases the oil, add the smoked paprika, salt, hot pepper, and cumin seed. Cook the spices for a minute or two. Stir in the water, tomatoes, and chick peas, and lemon. Bring the stew to a boil, then lower to a slow simmer. If it is too thick add additional water. Simmer the stew for about 30 minutes. Stir in the mint and remove the stew from the heat. This can be eaten hot, room temperature, or even chilled in the summer months. Before I begin I have to chant the mantra for all, or at least most, of the recipes which I post on this blog…this is so easy to prepare, and it is delicious and nutritious. Okay, that out of the way, this is a classic recipe for aglio e olio (oil and garlic). Most Mediterranean countries have versions of this, and nearly any foodstuff can be prepared in this manner. The classic, of course is pasta, but it is great with vegetables, potatoes, and even seafood or chicken. The key is in browning the garlic and hot peppers…it should be started in a cold pan then heated slowly until light golden-brown. At that point lemon juice is added, which forms a temporary emulsion and creates a light sauce which is literally bursting with flavor (see the two photos just below. Once you have the sauce nearly anything can be added. In this instance I added asparagus, but as aforementioned, it is applicable with a large variety of foods, especially pasta. For mare recipes cooked like this click here. The recipe which correlates with this photos is below. Trim the asparagus of their tough ends, discard the ends, then set the asparagus aside. Combine the olive oil, garlic, hot pepper, and salt in a skillet then place it over medium-high heat. Stir the garlic and peppers in the pan as it heats. Stir and cook the garlic continuously until it is golden-brown, then add the water and lemon juice. Stir the ingredients together then add the asparagus. Turn the asparagus in the sauce, then cover the pan with a lid for just a minute or two. Remove the lid and baste the asparagus with the garlic, oil, and peppers. Cook the asparagus until it changes color but is still crisp, al dente. Transfer to a plate and pour the sauce over the asparagus. Aloo gobi…the classic Indian dish consisting of mostly potatoes (aloo) and cauliflower (gobi). Peas are often included. Spices vary and can be interchanged to your liking. In the version I made for dinner last night (pictured) I also added whole coriander seed. I used dry chilies but fresh can be used as well. Interchange ingredients and seasonings. Eat this as a side or main course with basmati rice. It’s simple to make, super delicious, and healthy. Make it and you won’t be sorry. Heat the oil over medium-high heat in a large skillet and add the onion and potato. Cook these for a couple minutes, until they just begin to change color. Add the garlic and ginger and cook another minute. Stir in the black mustard seeds, salt, turmeric, cumin seed, and crushed hot pepper; cook for a minute to release it’s flavor and aroma, then stir in the cauliflower, coating it with oil and spices. Add the water, then cover the skillet and cook the potatoes and cauliflower for a couple minutes. Stir in the peas and lemon juice; cook for a minute or two. Remove the pan from the heat and stir in the cilantro. Okay. So this tofu recipe is so delicious even a dedicated “tofu hater” will like this. Seriously. This is a slight variation of this original version where the tofu was baked. What’s different with this version (and is not represented in the printed recipe below), is that I added a couple teaspoons of smoked paprika to the marinade, diced the tofu (instead of slicing it, and after marinating it I rolled each piece in cornmeal. Then instead of baking it I pan-fried them in olive oil to crunchy deliciousness (yum!). And yes, before you ask, this recipe can also be baked but it will not be as crispy (I tried it both ways). Anyhow, try this recipe and I dare you to try to just eat one. Remove the tofu from its package and drain it. Set the tofu on a plate with 2 or 3 plates on top of it, gently squeezing out some of it’s moisture. Leave the tofu to drain for 10-15 minutes. Slice the tofu about ½ inch thick. Lay the tofu in a pan and pour enough of the marinade over the tofu to cover it, turning it to coat all sides. Marinate the tofu for at least 30minutes. Preheat an oven to 350F. Transfer the tofu to a baking sheet that is fitted with a wire rack, leaving some of the marinade on the tofu. Bake it in the preheated oven for about 20-30 minutes, or until the tofu begins to brown at its edges. For firmer tofu, turn it over and bake another 10 minutes. This is delicious straight from the oven, at room temperature, or chilled as a snack, on a sandwich, or salad. Combine the garlic and olive oil in a small skillet and place it over a low flame. Heat the oil until the garlic begins to simmer. Cook the garlic very slowly until it is golden brown, then remove the pan from the heat and allow to cool in the oil to room temperature. Once the garlic and oil are cooled, combine them in a food processor with the remaining ingredients and process until smooth. Drain the tofu and remove it from its package. Place the tofu between two plates and allow it to gently press out some of its moisture for about twenty minutes. Then dice the tofu and place it in a shallow pan. 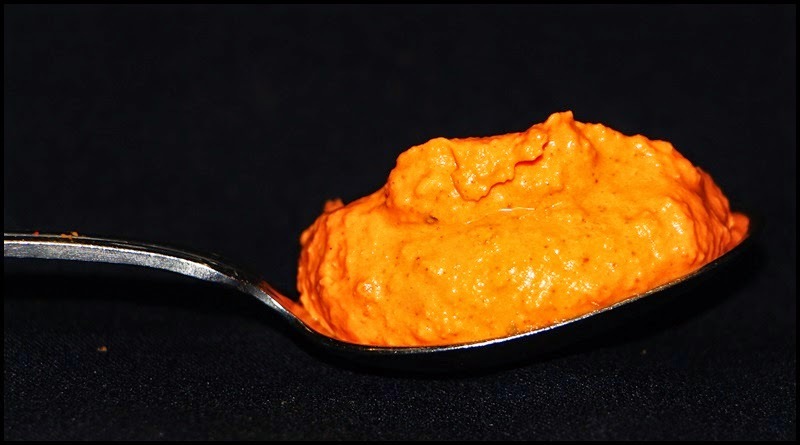 In a separate bowl, mix together the hot sauce, cornstarch, onion, and garlic, making sure that the cornstarch is fully dissolved. Pour this mixture over the tofu and gently lift and move it to insure that is fully coated. Allow it to marinate for about 20 minutes. Then remove the tofu from it’s marinade to a clean plate. Heat about 1/2” vegetable oil in a large skillet over medium heat. And when the oil is hot carefully add the marinated tofu. Fry for about 5 minutes, turning as necessary, or until golden and crispy. Transfer the crispy tofu with a slotted spoon to absorbent paper. This is another one of those recipes that is so easy to make and so delicious that you’ll wonder why you don’t make it more often. You can use fresh peppers—as I did for this recipe—or jarred ones which you rinse. I cooked the peppers over the grate of my stove at work, but this time of year it is fun (and flavorful) to cook them outside on a charcoal grill. And as with most my recipes, this is just a suggestion…add whatever flavorings or seasoning you would like. You’ll also note that when I say this is easy to make, it truly is one step. Once the peppers are roasted you simply combine everything in a food processor and puree it. The hummus will keep for about 5 days in the refrigerator…but it is so delicious it will likely be eaten straight away. Combine all of the ingredients in a food processor and process to a smooth puree. Remove stickers from the pepper. 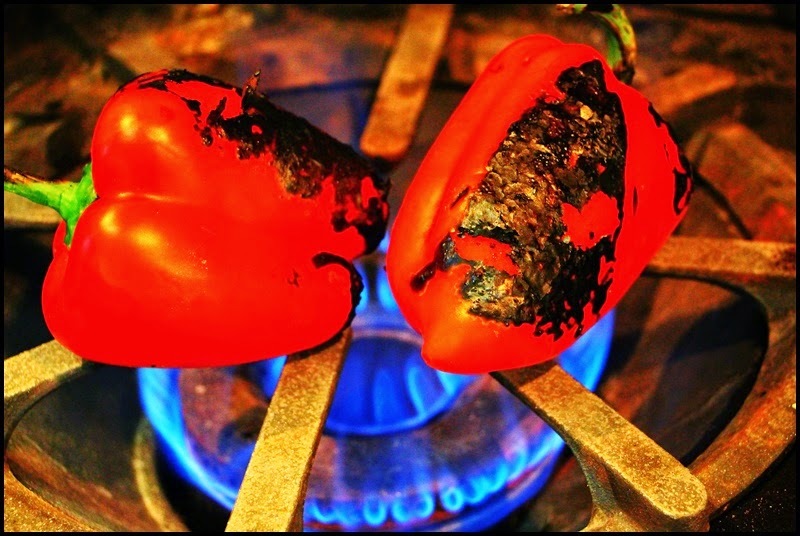 Place the pepper directly on the grate of your gas stove with the flame adjusted to medium. Using a set of tongs turn the pepper ever couple of minutes until the entire outside is completely black. Immediately place the pepper(s) into a small paper bag and seal it closed. Allow the pepper to rest for a couple of minutes. The steam that naturally occurs loosens the skin. 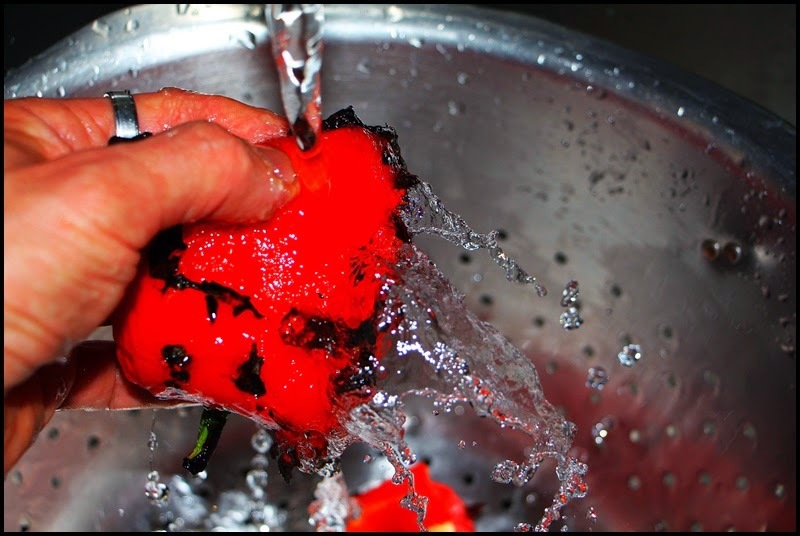 Remove the pepper, and while holding it under cold running water gently rub of the blackened skin (it’s wise, but not essential, to do this over a small colander to catch the skin, which may clog the drain). After the skin is removed gently tear the pepper in two and remove the stem and rinse the seeds.